In some cases, it may be desirable to be able to connect bare, unterminated wire to a circuit. Screw terminals provide a good solution for this. They are also good for situations in which a connection should be capable of supporting multiple different connecting devices. The downside of screw terminals is that they can come undone fairly easily, leaving a bare wire waving around in your circuit. A small dab of hot glue can address this without being too difficult to remove later. Screw terminals are typically designed for a narrow range of wire gauges, and wires that are too small can be as big a problem as wires that are too big. SparkFun carries four types of screw terminal – a 2.54mm (0.1" breadboard standard), a 3.5mm, 5mm, and 10mm pitch version. Most screw terminals are highly modular, and they can easily be extended at the same pitch by simply connecting two or more smaller sections together. 3.5mm pitch screw terminals, showing the insertion point of the wire to be connected, the retention screw which holds the wire in place, and the modular connectors on the sides of the individual units allowing multiple pieces to be ganged together. Alternatives to screw terminals include spring terminals (a.k.a. "push-in", "cage-clamp", or "poke-home" connectors). Spring terminals work in a similar fashion as screw terminals. However, instead of tightening a screw to make a connection with piece of wire, a spring clamps together pieces of metal together. Spring terminals provide an alternative to screw terminals. They work better in environments with a lot of vibrations (i.e. automotive applications) or when a wire expanding/contracting due to temperature cycling. 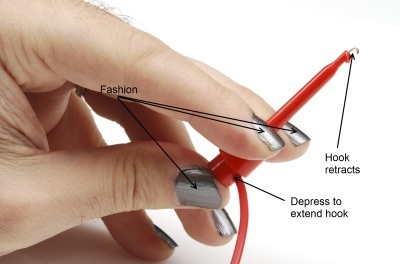 Additionally, the tension is automatically adjusted to the wire gauge (assuming it is within the accepted wire thickness) as opposed to variances in tension when a user tightens the screw terminal. 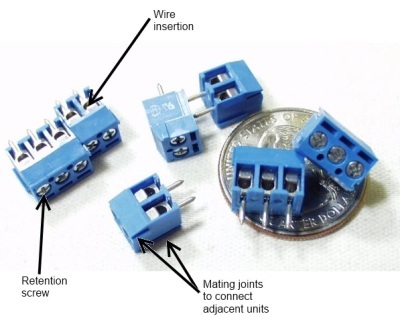 Below are a few spring terminal connectors that SparkFun carries in the catalog. Certain boards (like the gamer:bit, LumiDrive, and Qwiic MP3 Trigger to name a few) are populated with a spring terminal for easy access to I/O pins. A ball-point pen pressing down on the tab of the gamer:bit's poke-home connector to connect a piece of wire. 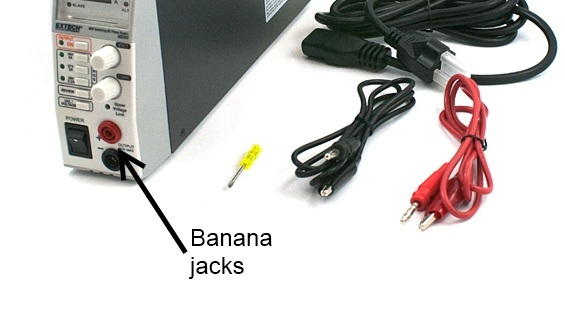 Most pieces of power test equipment (multimeters, power supplies) have a very simple connector called a "banana jack" on it. These mate to "banana plugs", crimped, sprung metal plugs, meant to make a single power connection. They are frequently available in a stackable configuration and can be easily connected to any type of wire. They are capable of carrying several amps of current and are inexpensive. Stackable banana plug. Note that there are two different ways to plug in an additional banana plug. Extech variable bench supply with banana jacks on the front. Named for obvious reasons, alligator clips are good for test connections to posts or bare wires. They tend to be bulky, easily cause shorts to nearby bare metal, and have a reasonably poor grip that can be easily compromised. They are primarily used for low-cost connections during debugging. A "third hand" tool, which uses alligator clips to hold work pieces, holding a wire terminated with an alligator clip for electrical test. Note the plastic boot surrounding the alligator clip, to make it less likely to short to other connections. For more delicate probing operations, there are a variety of IC clips on the market. These are sized to allow a user to clip them onto the pins of an IC without contacting adjacent pins; some of them are delicate enough to be clipped onto even fine-pitched SMD component legs. These smaller clips can be found on logic analyzers as well as test leads, which are great for prototyping or troubleshooting circuits. A large IC clip on the end of a wire. This clip is still small enough to be connected to a single leg on a through-hole chip without causing a problem for adjacent pins.